After more than 15 years of caring and taking care of other companies in my industry, I decided to talk to you about my business and what I do in life, on top of my passion for photography and writing. Nicolas . R will share with us his story as a movie/music lover and the acoustics and optimization work we did together. He has kindly agreed to share his experience with my company’s products and the on-site demonstration service we offer. The goal is to demystify some preconceived ideas and perhaps encourage you to explore the full potential of your (often) expensive equipment. The experience is step by step; as to realize what is changing and happening at each step before going further. It is an exercise that must be fun and didactic in the same time. How it all began and testimonial of our meeting. My first experience in Home Theater started back in 1996 with a VHS tape, a JVC Dolby Pro-Logic receiver and 5 old speakers (given to me by different family members). I still remember my amazement when I listened to my first movie. I was hooked! Fast forward 21 years later, I’m still enjoying the hobby and my equipment has been upgraded year after year. I am now settled in a new house and my living room doubles as a Home Theater, Music Room (80%-20%) and Entertainment space. The whole floor is open concept and I have a very high ceiling. Not the easiest room to optimize. All my equipment is now up to par, powerful sub, pre/pro with ARC room correction, powerful Bryston amplifiers but I was lacking something sound wise. I could not figure out what it was. I tried to upgrade my equipment, but I never got the results I wanted. By now I was convinced that my room was bad and I had to live with it. After searching the web and reading forums on acoustics treatments, I stumbled upon the inovaudio website. I contacted the owner Marc PHILIP and he was very friendly and helpful in his approach. The plan was for him to come to my house for a whole day and work in steps to improve my system. We would work with my equipment and my listening material (music and movie). He was also very understanding that the project could be evolving over time as we all do have a budget. Marc came over two weeks later. What surprised me most was there was no fancy electronic equipment to measure the room, no RT 60 taken before and after the treatment. Marc would rely on his deep knowledge of acoustics and his experience. But most importantly my ears and feelings. The first step was to set up my speakers and subwoofer. He did some calculation to get the optimal front speaker distance from the back and side wall and also calculated the optimal woofer to woofer distance and toe-in for my left and right speakers. He also grounded the sub and the LCR speakers with inovaudio spikes and with his custom wood pads with Corian or Composite inserts + aluminium + plywood. I already saw and improvement right away! More dynamics in the sound but we were just getting started! Basically the phase adjustment helps redirecting the sub voicing to the front of the soundstage and blending it with the LCR. The lower frequencies of the subwoofer were now coming from the front of the room instead of the right corner. Again progress was made! According to Marc, the big trouble spot of my room was my TV that was sitting in between my front speakers. 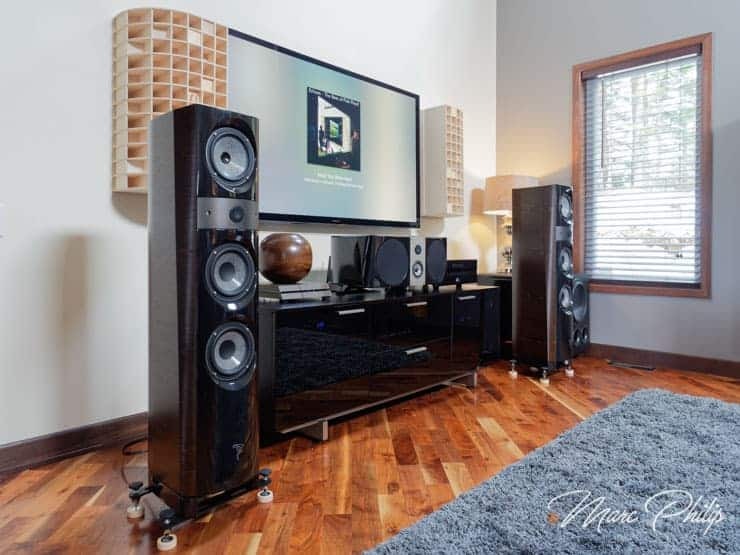 Marc installed two inovaudio 2D MK3 diffuser on each side of the TV. We then started music and everything changed! I could hear every single note, every instrument was now separate and precise. Bass was tight and focused. Finally, my room was sounding like it should! Marc was still not done, we also installed a beautiful wood diffracter (made by Pro Design Audio) on the side wall that again improved the clarity of the sound. We all know that the Wife Acceptance Factor (WAF) is very important and my wife loved the beautiful inovaudio wood diffuser but mostly was impressed with the sound. That night we opened a bottle of wine and listened to music for 4 hours! My next step is the two rear inovaudio Pearl Rain bass corner that are coming in the next months, upgrading my regular outlets to Furutech GTX-D Rhodium and a dedicated power outlet for my subwoofer. I recommend to everybody that is serious about audio to call Marc Philip and schedule an appointment. Even afterward he still keeps in contact with you via email to give recommendation and help with your system. This will be the best return on investment you will ever get! Small precision for any useful purpose, we have also coupled the central channel with 3 points and 3 cup-spikes inovaudio. All is left to do is to put a steel plate and plywood square on top to complete the whole thing, which is supposed to be in progress when I write these. You will have noticed at no time we did talk about cables or nonsense snake oil … and please note, the dimensions of the acoustic panels are based on the mathematical rule of the Phi number. Thank you very much Nicolas for these kind words and for your concise presentation. Your testimony is a perfect reflection of what happened in reality. I hope this will encourage other music and movie enthusiasts to add value to their system through acoustics and good optimization. This article was written by Marc PHILIP freelance writer and Nicolas . R, all rights reserved, copyright 2018, texts and photos are the property of the author and the magazine.